For the 24 hours to 23:00 GMT, Gold rose 1.53% against the USD and closed at USD1236.00 per ounce, amid broad weakness in the US dollar. In the Asian session, at GMT0400, the pair is trading at 1234.40, with gold trading 0.13% lower against the USD from yesterday’s close. The pair is expected to find support at 1222.10, and a fall through could take it to the next support level of 1209.80. The pair is expected to find its first resistance at 1243.00, and a rise through could take it to the next resistance level of 1251.60. 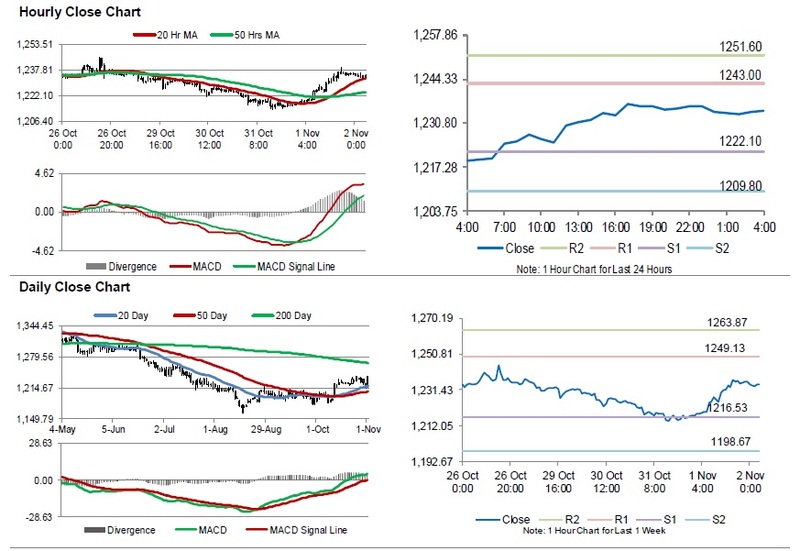 The yellow metal is showing convergence with its 20 Hr moving average and trading above its 50 Hr moving average.